Today is the 5th Global Day of Slow Living and, to start with the right step, this post comes a little later than the usual time. I am a woman of her word, so let it be a slow day. A slow living day gives you the chance to regain your time, your natural rhythm, your spaces. A slow day makes you appreciate the small joys of life, those moments you usually take for granted but that make a difference. A slow day is a quality day. So let’s start with a mea culpa. For some months now I do not know what a slow day is. I got the bad habit of making at least two things together. I answer to an e-mail while reading an article I am interested in. I attend my hydrobike class while thinking about my upcoming post or, still worst, about what I’ll be cooking in the next month. I watch the TV while reading a magazine, or while updating my blog, or maybe even while cooking something. This frenzy is due to the moment: I am optimistic and I can feel positive vibes in the air. You have just one life to live and this beautiful and frenzy moment is to be lived moment by moment. But there is always the other side of the coin to be considered. There are precious moments that should be savoured pure, without outer intrusions. Today we will put more commas than usual in our sentences, we need a break once in a while! Here it is an exercise to do to regain calm and tranquility, to give breath to your breathless mind: this is a pannacotta made with agar agar powder, in 4 layers. As a recipe in itself it is really simple, once you become familiar with agar agar, but it calls for patience and slowness. 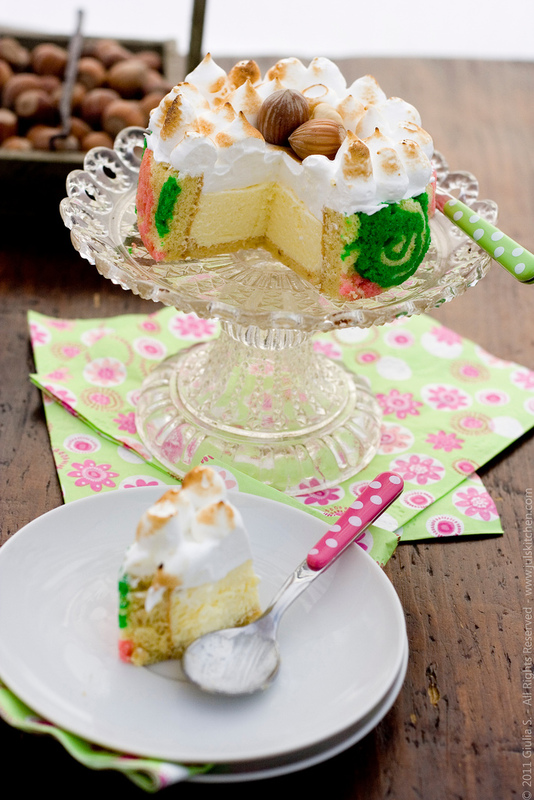 The four layers, to be neat and precise, want you to deal with the recipe in a slow mood. You pour a little amount of cream, then you wait for it to get firm, to support the second layer. The exercise is right here: you wait, you take it easy, you sit down and relax. It is strictly forbidden to do something else at the same time, strictly forbidden to check e-mails and texts, FORBIDDEN! You can leaf through a magazine, calmly, reading and feeling the paper under your fingers. 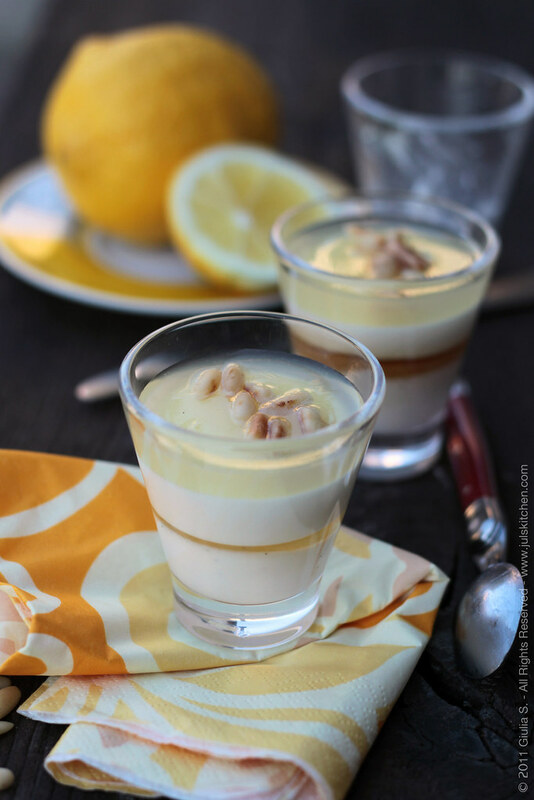 Eventually, you should feel relaxed and satisfied and you could savour, spoon after spoon, a little glass of lemon & honey pannacotta as a reward for your slow day! Pour the cream and the sugar in a small saucepan. Add the vanilla bean and warm on low heat until it start to simmer gently. Add in the agar agar powder and whisk to dissolve it. Let it simmer for a minute and remove from the heat. Squeeze two lemons to have 150 ml of filtered juice. Add 100 ml of water and place over low heat with 2 tbs of sugar and the peel of a lemon. As soon as it gets to the boil, add the agar agar powder and whisk to dissolve. Let it boil for one minute and remove from the heat. Pour the pannacotta in small glasses or pots in a layer of about 1 cm. Let cool a few minutes: when the pannacotta is set – it will need just a few minutes with agar agar – pour over the liquid acacia honey with a spoon in a layer of about 5 mm. Pour over again some pannacotta, making a layer of about 1 cm and let it cool again, so that it will get firm. Now pour over the lemon jelly and make a layer of about 5mm. Wait a minute and decorate with slightly toasted pine nuts. If the jelly or the pannacotta are already set and you can’t pour them into the glasses, no worries! Just bring them back to the heat and they will get liquid again, ready to be poured in your favourite pots. 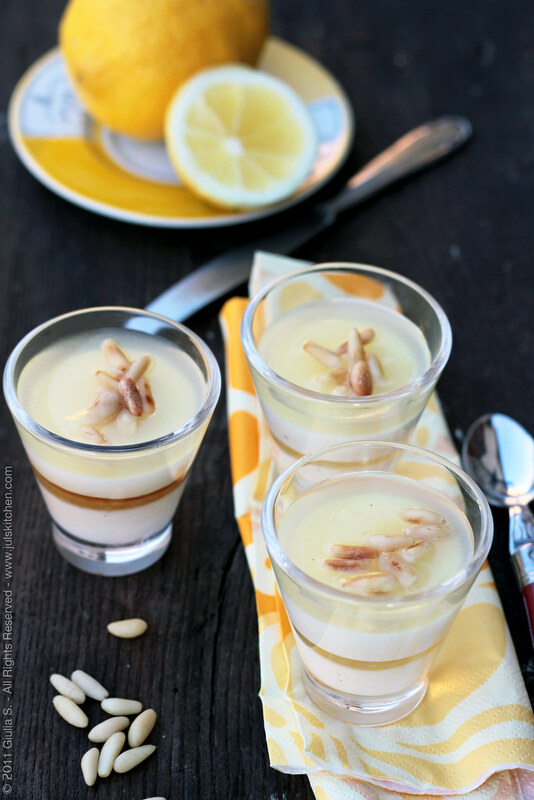 Let your honey and lemon pannacotta pots rest for an hour and enjoy! Notes to the ingredients. I tried with 3 different kinds of honey: acacia, eucalyptus and lavender wildflowers. Acacia is the best for texture – fluid and malleable – and flavour, as it matches well with the citrus jelly without adding too much sweetness. Try with the honey you prefer. I’d be curious to test chestnut honey, liquid such as acacia but with a bitter note that would make this pannacotta perhaps even more interesting. oh, I love that addition of lemon jelly! Very refreshing. You did a great job! Signorina, che belle fotografia! E una ricetta veramenta delisiosa! I’ve never tried using agar agar before, if I can find it here I will definitely try it. These look wonderful! I will definitely be trying this out! Also love the imagery. Fresh, clean, delicious! I am also guilty of constant multi-tasking. Cooking is a great way to escape that and this recipe looks delicious. mama mia…. this looks sooooo good !! This is just stunning! 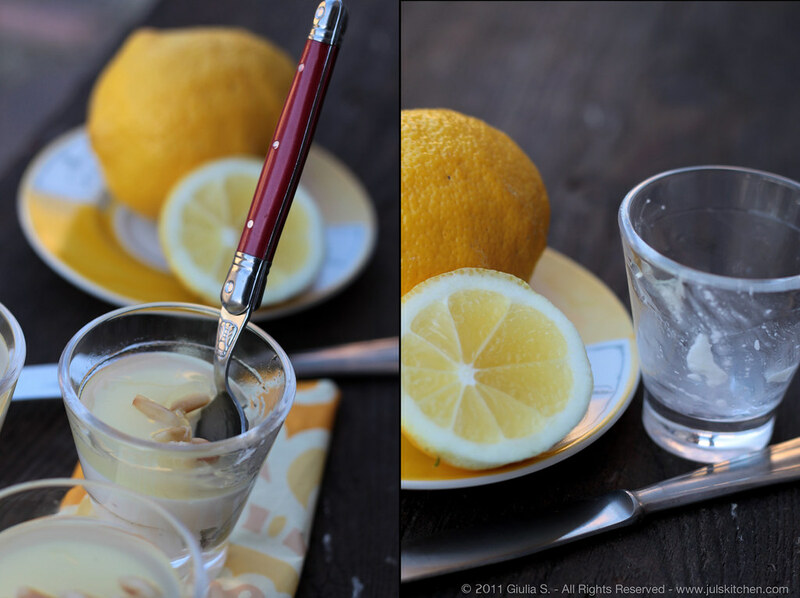 I am sure it tastes wonderful, too… I love lemon and honey together! 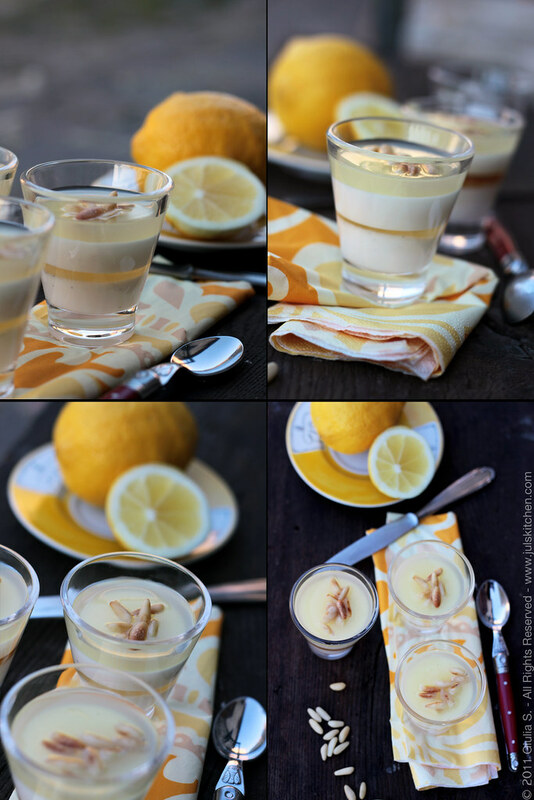 I’m such a huge fan of lemony desserts. This sounds absolutely perfect! The photograph is beautiful, Juls. Like the flavours too with the citrus balancing the sweet of the panna cotta. I especially liked that you used agar, and the pine nuts too. want a bitter note ?I love it I’ll try it, nd I suggest youwith my best !